First off...a public apology to all those I took down with me on this one. Oh my, this was a boring knit. Yes it was a very long repeat...but guess what? Every row was pretty much the same -- just off by a stitch at a time. Ugh! The results, though, I'm quite happy with. Yarn KnitPicks Alpaca Cloud 100% Baby Alpaca in Tidepool. Approx 350 yards. The needles -- I wanted to like them, I really did. The cord is amazing. I could sit and play with the cord, bending it this way and that. It's a great tactile experience. I even really like the way the needles feel in my hand. Their points are nice -- not too sharp, not too dull. But, I don't like their lack of weight. Would I use them again? Probably not. Number of repeats I did 14 or 15 repeats instead of 11. I could have done 1 or 2 more but I just wanted this thing to be over! Yarn This is very nice yarn, and for the price this is amazing yarn. It gets a tad fuzzy -- sorta like a mohair halo -- and is wonderfully soft. I sub'd a non-mohair yarn because I wanted to make something that I could wear everyday. I think I succeeded. In the pic above I'm wearing it with my denim jacket. I know you don't see the intricacies of the lace but I'm OK with that. I'm not a traditional lace-wearing sorta girl. I like knitting lace though, so this is a perfect compromise. I get to knit it and wear it. I could have picked a color with more contrast (maybe one of the light blue shades?) but green is my favorite color. I finished this thing just in time. This weekend is was windy and in the 30s, and my lacy alpaca scarf was just the ticket to keeping me warm without feeling like a bundled up kid during the first snowstorm of the season. KALers -- how ya doin? I stopped the weekly posts because the progress slowed down a lot. Drop me a line or leave me a comment when you're done and I'll link to you in a post! Last week when I posted about this sweater there seemed to be a decent amount of interest. To my knowledge, the pattern only comes in French -- a perfect candidate for a knit along, non? Let me know if you're interested and if there are enough people I'll create another blog for it. We'll need a place to write to each other and talk through the translations. Gauge I don't have the pattern yet but it looks like both yarns are held together throughout. The sunset yarn is a metallic laceweight so I'm guessing the sweater's gauge is similar to Partner's gauge of 15 sts and 20 rows over 4 in/10 cm. BTW, this (found via the Colchique Along) couldn't have come at a better time. It's the best French-English knitting term dictionary I've come across. Oh -- and if you have any names for the sweater please leave them in the comments too. If we use the name I'll send you a little package in return! Pattern Jaywalker. 84 stitch sock at 9 spi (pattern recommended just under 8 spi but I liked the yarn better at 9). Yarn Tess Super Socks in an unknown coloway (if I had to guess I'd say Confetti). Is it just me or does Tess not mark the hanks with the colorway? Yardage I used 80 grams which translates to approximately 360 yards. I made several small mods to the pattern. I used a tubular cast-on and did a 1x1 rib instead of a 2x2 rib at the top. I used 2 circs instead of DPNs. The pattern adjusted to the circs just fine, but you did need to think about where to split between the 2 circs. Because of the way the pattern increases and decreases you need to split the circs right where 2 increases occur. In order to do this and still have the pattern look right you also need to do the first increase at the end of needle 2 (so the increases are right next to each other). I don't know if I'm explaining this well, but leave a comment if this doesn't make sense. It's not critical that you split the needles this way, but if you don't you'll have to reshuffle stitches every 7 or 8 rows. Garter stitch short row heel. I didn't follow any pattern for this so I'm not sure I did this correctly. I wrapped all but 9 sts for the 84 stitch sock. When going to pickup the wraps I had to pickup the WS wraps differently. This surprised me at first since it's garter st. On the WS rows I lifted the wraps off of the stitch that it wrapped. So from right to left my left-hand needle had 2 wraps and then the stitch itself. Then I did a sssk (knitted all 3 together). This formed the best-looking RS. If anyone knows of a better way to pickup wraps on the WS of garter stitch please let me know! Once I finished the heel I needed to decrease a bit. So I added in a 3-stitch gusset. 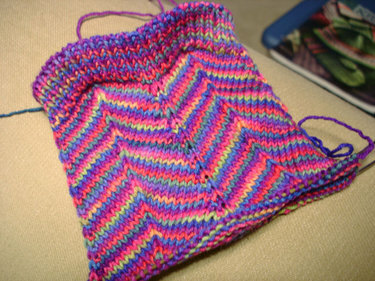 The first 3 rows after I finished the heel included the double decreases at the sides. After that I did a SSK or K2tog just like the pattern says. This yarn is a dream to knit with! I can't believe I've had Tess sock yarn in my stash for a year! It is very stretchy and with 20% nylon I expect it will hold up well. There was a considerable difference in softness once I washed them. I washed the first sock as soon as I was done and you could really tell which one had been washed. The yarn did lose some magenta color when washing but I only knew that because of the color of the water. The yarn itself remained vivid. I'm teaching a beginner's lace class at Woolbearers in March. I'm using lacey lamb and I *love* it. The label is all in chinese and I've always thought this yarn was cashmere -- but it's not! It's 100% extra fine lambswool and they say it's machine washable. Don't worry -- there isn't a chance in hell I'll be dropping this baby in the washer. But still, there's something enchanting about a yarn that's so soft and fragile and can still hold its own against the ol' Maytag. So the yarn -- if you haven't tried it yet you really need to. At $14/ball it's a great deal and I think it's a perfect Christmas gift for a lace knitter. It does split on occasion but nothing that's too bad. I just need to be conscious of it while doing k2togs. I'm enjoying this yarn so much that I knitted way past what I told myself I needed to get done this weekend. I ended up not starting on Sugarplum until around 9pm on Sunday. It isn't such a bad thing because the quicker I get this sample done the quicker I'll get students signed up for the class. I haven't had any real focus on sweater projects lately. I want to knit a sweater -- I just keep getting pulled in all directions. I've been looking though lots of blogs, galleries, and some of my older knitting mags -- looking for that *perfect* sweater to draw me in. Then this morning I got an email from Phildar and looked at their new books. There are a few in there that are seriously worth consideration. The books are only in French, and while I think it's fun to try and translate from French, there's also an English Knit Along for the camel-colored top. The best part? Someone posted an English translation! I like both of these sweaters a lot. Now for the big question -- is there anything in my stash for either of these? The mail has been so much fun this week! On Saturday I got my final Better Pal package. I learned that my pal was Ann! Ann was a fantastic pal. We didn't know each other very well beforehand, so she asked Katy for some help. Well the two of you did really well! The final package is up there on the left. I got 2 hanks of Manos in a beautiful purple and red colorway. I'm thinking scarf but not sure of a pattern yet. And then I got a cute Santa plate, a notebook (great timing since my knitting bag notebook is out of paper) and a package of mulling spices. I didn't realize until I took this pic that the metal Christmas tree on the front is also a spice ball. I thought it was an ornament! I make mulled cider all winter so this will be put to good use very soon. The package on the right is from a swap that Jacqueline and I did. Wow there's a lot of yarn in there. I am pretty certain that she went way over budget on this package. I am thrilled with everything! The turqoise handdyed in the back is a super-soft worsted weight wool. It has to be a scarf because it's so soft. The red yarn in front is a tweed yarn from Marta's Yarns. I've been tweed-obsessed lately so this is perfect. The green laceweight is also from Marta's. I will be casting on for a Lace Leaf Shawl soon but since it's to teach a class I need to use a yarn available in the store. It's too bad because this green would be perfect for it. The purple mohair is a deep shade with slight hints of pink in it. I don't know the yardage on it (Jacq - do you happen to know?) so I'm not sure what I'll do with it yet. It's very soft though so it needs to be made into something I get to touch often. The black skein is a 200 gram monster-sized ball of black 100% alpaca. It's a gorgeous, tightly spun yarn that needs to be showcased right. I love the look of the tighter spin so I'm thinking I'd like to incorporate some kind of dropped stitch in there. The final yarn is the bright pink wool-angora blend. This is my favorite! It's unlike anything I'd ever buy myself but I can definitely see myself wearing it. It has a perfect proportion of angora (30%) so it's soft but not overly fly away and itchy. This has to be a scarf and will probably be the first thing I cast on for out of this package. I need to find the perfect project for it though. Jacq thought the backyard leaves from Scarf Style would be a good choice and I agree. Any other ideas? Oh, and you see that little flower-covered piece on top of the green laceweight? It's a measuring tape that's covered with some felted wool. I love the fact that I now have something to drop in my knitting bag to remind me of Jacq and our little swap. Thanks ladies! You were both amazing swap pals! I also made a change to the way I normally do short row heels. I've been using Wendy's proportions for heels. That is, I've been leaving one fourth of the sock stitches at the heel as unworked stitches that I didn't wrap. Well, last night I also got my copy of Folk Socks and noticed that Nancy suggested doing an afterthought heel until there was one inch of stitches left. Structurally the afterthought and short row heels are very similar so I thought I'd give it a try. This heel fits me much better! I was a bit concerned that the garter ridges would be uncomfortable but at such a small gauge that doesn't seem to be a problem. I won't know for sure until I wear them, and at this rate I may be done before Thanksgiving! I've had this Tess yarn wound up for 3 months now! At first I thought I'd make gauntlets, but that didn't take. Then I tried a few stitch patterns to use as a scarf but the colors were too bright and crayon-like for me to think I'd actually wear it as a scarf. In the end I went back to my go-to project -- socks. Do I really need to tell you the pattern? In true grumperina form, I have made a couple changes. I prefered the way the yarn knitted up at 9 spi. I know it's really tiny but I just don't like loosey goosey knitted socks. They look bad and they wear worse. So, I cast on for the larger sock size and actually got a sock that matches the smaller size -- perfect. The other change I made was to use a tubular cast on and a 1x1 rib. Why? The 1x1 tubular cast on is *so* much quicker. At 9 spi I figured I earned at least one short cut. I do have one other change in mind. Christy you probably know what it is since I told you I liked your sock that used it this weekend. The rest of you will have to wait a few days. I'm such a tease, aren't I? It's funny how much pleasure I can get out of a little scarf. I'm so happy with how this turned out. Pattern Mistake Rib: CO 23. Every Row: *K2 P2* to last 3 sts, K2 P1. Slip first stitch of each row knitwise. Yarn Knit Picks Decadence 100% Superfine Alpaca in Winter Berry. 2 full hanks (242 yards) for scarf and approx 30 yards for fringe. Needles US 10. I started with my Boyes because I love knitting narrow items on my straights. But, the point of the needle combined with the loose spin of the yarn caused extra splitting. I switched out to Addi circs and it was better. Even still, the US 10s killed my hands and I took several days off before knitting the last portion of this scarf. Size 71 inches long without fringe and 6 inches wide. In my opinion this is a perfect length for a scarf. It's longer than I usually do and I love it. The width will probably decrease 1-1.5 inches with wear if it's anything like my mistake rib scarf. I'm tempted to order some of the yarn for a scarf for me. It's really soft and warm, but my hands will not be happy with those US 10s and I don't think I'd like the yarn knitted any tighter. The scarf has great drape and I wouldn't want to lose that. I'll hold off for now, but I have to place a knitpicks order later today and I'm not sure I'll be able to hold out!